Architen Landrell is currently responsible for the installation, subsequent striking, removal from site and storage of a number of tensile structures. All have unique characteristics regarding the type of structure, the installation methodology and the environment in which these structures are erected. This article will look at three case studies of demountable structures to give an idea of the technicalities involved in creating, maintaining and constantly using tensile structures. This structure is installed in a listed courtyard in Soho, Central London. 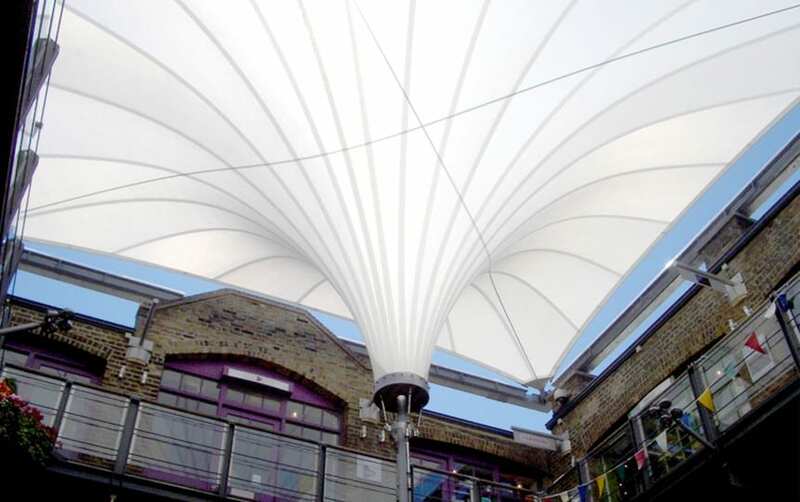 Designed by MRP Architects, the intention of the event canopy is to provide short term temporary cover for events such a fashion shows within the courtyard with some protection from the vagaries of the British weather. The brief at Kingly Court was for a stylish temporary structure that would provide the perfect backdrop for events, and yet provide shelter from the changeable British weather. Not only was there a real need to quickly transpose, install and remove the canopies at short notice but it was also vital to ensure as much of the canopy and ancillary structural components as possible could be removed to comply with stringent planning requirements. The structure comprises three inverted fabric cones, protecting the vast majority of the courtyard below from the weather. The shape of the cones insisted that some kind of drainage was installed, so Architen Landrell suggested a design to collect and channel rainwater to central down pipes, keeping it out of the way of the shoppers below. Fabricated using high translucency Gore Tenara membranes, the cones were flexible enough for continual installation and removal whilst still retaining full strength and an appealing aesthetic as well as forming a shade structure. Total area of the three cones is 456 m2. Architen Landrell has been successfully managing the installation, removal and storage of this structure every time the client has required since its first installation in April 2007 and as of April 2009 it will be at the end of the first year of a three year contract for managing the structure. 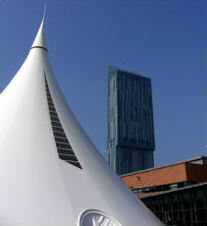 This structure was first commissioned by the Manchester City Council for the Manchester International Festival. It takes the form of a tepee with a fabric membrane covering 873m2. The pavilion was designed and engineered by our experienced in-house design team and manufactured in PVC coated polyester fabric in order to achieve maximum strength and durability but also to enable a quick and easy installation and removal. The temporary structure was installed on site ready for the opening of the festival on 28th June 2007 and remained in place for a number of weeks before being taken down at the end of the festival period. The structure was re-erected in the summer of 2008 on a different site in Manchester. This installation required the modification of the local environment to accommodate the structure and then reconstitution of the environment when the structure was struck in the first week of 2009. Architen Landrell has now taken on the responsibility for the storage of the structure and will be re-erecting the structure on yet another site in the centre of Manchester in May 2009. 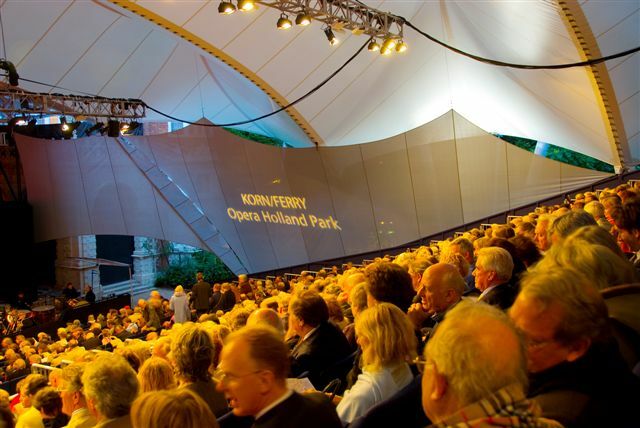 The original canopy, installed in 1988, fully covered the stage and seating area, leaving the side open for ventilation in the hot British summers. After reaching around twenty years old, the original canopy reached the end of its practical life, making way for a more modern canopy to take its place. The brand new canopy was built and installed in time for the beginning 2007 season and came in useful as the wet summer unfolded. The canopy consists of four main masts in two V-shaped configurations to allow maximum strength. Compared to the original canopy, the new structure increased the space covered from 1200 to 1600 square metres and expanded the capacity by a further 23%. The height of the apex also increased to create steeper and more comfortable seating areas beneath it. Architen Landrell have a long term contract for the transport to and from site and winter storage all of the steel elements of this large structure, the largest spar massing 2 tonnes. Architen Landrell is responsible for the erection and dismantling operations every year. As can be seen from the above, Architen Landrell deliver a fully comprehensive service that encompasses a wide variety of situations for a variety of demountable structures over the long term. All of the structures mentioned above involve storage and transportation to site of fabric membranes and associated steel elements. The installations involve the management of crane operations working next to listed structures at Kingly Court and Holland Park. The management of the Manchester Pavilion involves working closely with the City Council and alterations to the local environment so that the structure can be erected any where the Council would like. Once the pavilion needs to be removed Architen Landrell manage the reconstitution of the altered environment back to its original condition.